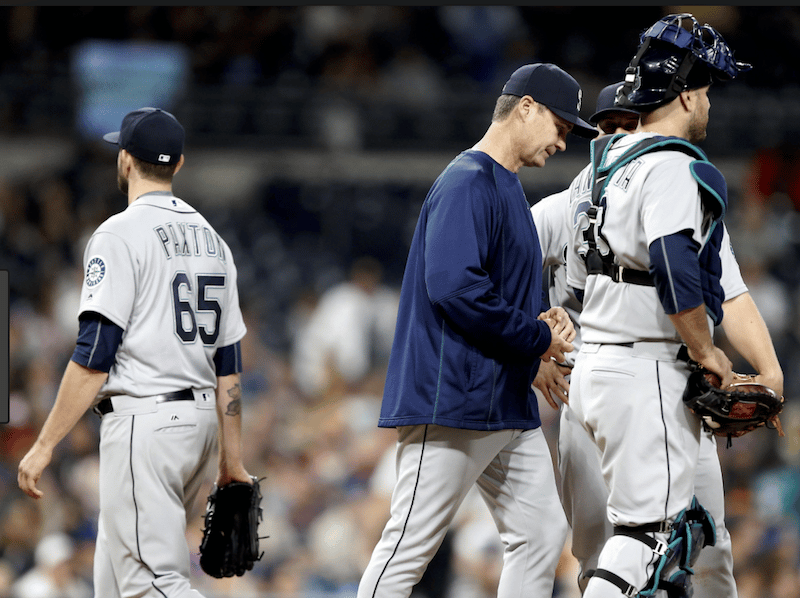 Under rule 5.10 (L), (3) (4), a manager is prohibited from making a second visit to the mound while the same hitter is at bat but if a pinch-hitter is substituted for the batter, the manager or coach may then make a second visit to the mound but must then remove the pitcher. The D’backs hosted the Giants on Aug. 2, 2018, in a game won by the Giants, 8-1. Entering the eighth inning the Giants had a 3-1 lead with the bases loaded. Chase d’Arnaud was scheduled to bat against Brad Ziegler. D’backs’ pitching coach Mike Butcher made a visit to Ziegler. Giants’ manager Bruce Bochy then sent up Alen Hanson to pinch-hit for d’Arnaud. At that point D’backs’ manager Torey Lovullo asked plate umpire Tony Randazzo if he could remove Ziegler for TJ McFarland. Randazzo, disregarding the pinch-hitter part of the rule, said no because Butcher had already visited Ziegler. Hanson then batting against Ziegler, hit safely to right field scoring Buster Posey from third base. Before the inning was over the Giants sent 10 men to the plate scoring five runs on six hits and an error. Randazzo misinterpreted Rule 5.10 (L). Because Bochy pinch-hit for d’Arnaud, Lovullo should have been allowed to remove Ziegler from the game. According to D’backs’ writer Zach Buchanan, following the game, crew chief Bill Welke told a pool reporter that Arizona should have been permitted to substitute Ziegler for McFarland. If true, why wasn’t the correction made on the field by one of the umpires before Zeigler threw a pitch to Hanson? Because there was apparent confusion of the rule in the D’backs’ dugout, in my opinion, Lovullo should have asked for a rules-check in NYC. Oops! MLB Umpire Catches Wild Pitch Runners Passing Runners, Oh My!